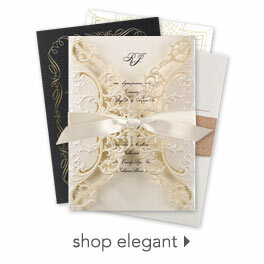 Modern design, lots of photos and plenty of room for your wedding details, these unique always together wedding invitation flip books are perfect for sharing all the necessary details with friends and family plus a few of your favorite pics. Ribbon wraps beautifully around the three photo cards to hold them together. Personalization Options: Ampersand is printed in your choice of foil color. Background is printed in your choice of color. Your wording is printed in your choice of colors and fonts. Your choice of 3-4 photos.